I was handed a Game Boy, grey and bulky with purple buttons and big enough to be classified as some sort of bludgeoning tool or weapon nowadays. I’d probably need a briefcase just to carry the thing around. However it was the first of many hand-me-downs from my older siblings, and one I didn’t let go of for quite some time. They gave me a few games as well, but the first one I ever pressed the Start button for, was Tetris. We all know Tetris, everyone has played it at least once in some fashion or another, everyone knows the theme song, everyone knows the rarity of that blasted line piece. I remember being entranced by the music, by the sound effects of blocks turning, especially the ending high-pitched squeal given whenever I failed a level. I became very accustomed to that noise. This was a whole new world for me, I was too young to have really met other kids, and when I did we were all still too young to really talk about video games, just action figures and doodling with markers. 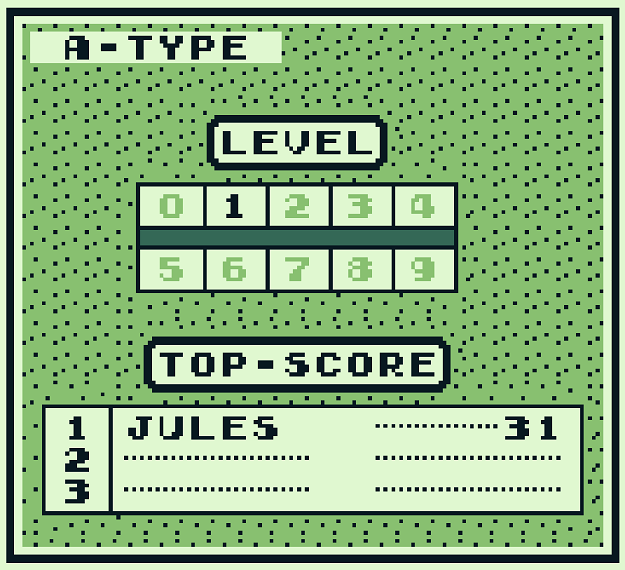 Tetris was something special to me, it still is in some regard. However something didn’t quite click when I first started playing. See, I was also still too young to read, and this included instruction manuals, and I never saw the box it came in. 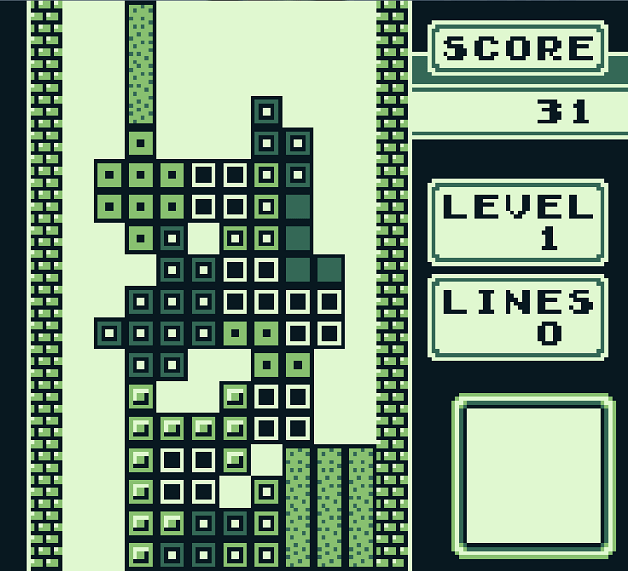 What was Tetris to me as a child? It was a house building game. How? 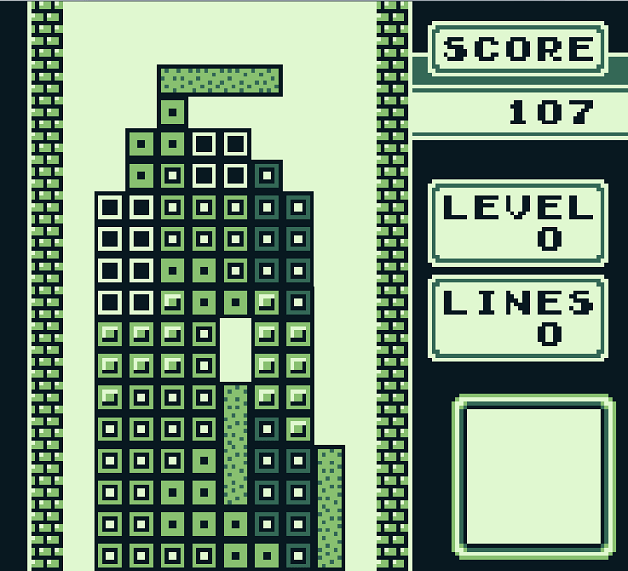 How did I ever think Tetris was about building a house? How could I conceive of such a concept, something so antithetical to the game’s core principle and goal! You clear lines of blocks, not build them up, alas that never really got through to me until my older sister caught me one time and had to explain it all over an afternoon. You see, I had a fairly wild imagination as a kid, one that definitely defied a lot of reason and it tended to get the best of me. With Tetris I saw the patterns on each piece like different building material, and each shape served a different function. Line pieces were either my base foundation or towering chimneys, square blocks were windows, and two of the same L-shaped piece put on top of each other formed what looked like a door. So when I processed all of this information, I began to create my masterpiece home, a jumbled mess of bricks, wood, stone, and glass as I saw it. It didn’t really go as planned. My teetering messes of pixels jammed together in a nightmarish Cubist collage were monstrous and it soured me that I could never figure how to win the game. It was impossible, to 5-or-so-year-old me, because every time I built what I thought was a fantastic terrace house the game wouldn’t stop and my blocks would fill the screen and it was Game Over. Or whenever I had what I wanted and put down my foundations and floors for the house, the line would disappear on me. Needless to say, I never really paid any attention to the score going up whenever that happened, so I was scandalised at the game supposedly punishing me. Just what kind of house did the makers of Tetris have in mind. In the end though, when my older sister saw me pouting about the game to our mum, she had to sit me down and explain in excruciating detail just what I was doing wrong. No, you cannot build a house. No, those aren’t windows. No, I don’t know why they look like that. Yes, the music is very nice. It was also at this point that she discovered another fatal gap in my knowledge, I never knew you could change the letters when spelling your name for the scoreboard. It confused me why I had to put my name down as “AAAAAA” whenever I played. Looking back on it, my scoreboard must’ve appeared like some existential cry for help. So thus began a period in my childhood where I devoured instruction manuals, never to make the same mistake twice. I made sure that every rule was followed, that I never strayed from the beaten path, that there was only ever one way and that’s the right way. In retrospect, I wonder if this is partly why I find myself making my own games, inside of others. Not in the same way people make Pac Man in Minecraft, or the custom playlists in FPSes like Halo, but more that I find something I can do in the default settings within the possible realms of the physics engine, and I make a game out of that. I find myself hopping from flag post to flag post in World of Warcraft, shooting bottles for target practice in the middle of heists in Payday 2, seeing how much time I can spend skirting the long grass in Pokemon. I suppose I like playing my own way. Not all the time, but occasionally just to scratch that itch. Oddly enough, I’m still terrible at building houses in The Sims to this day. oh Jules, this just cracked me up! 5 year old Jules is pissed that Tetris can’t respect her prodigious architecture skills.